Last of the Summer Roses. This morning I picked these roses and brought them in to enjoy. Little Isabella will watch over them and keep them safe. Fall is here in Missouri and the trees have turned lush golden and red. As winter approaches it is time to make new quilts and sew for any unfinished dolls and maybe even find a new one to pamper. I love the seasons and all the special joys each one brings and kicking through the leaves and seeing the rainbow of colors on the trees spanning the horizon as far as my eye can see. This entry was posted in antique, Armand marseille, Arranbee, bisque, china dishes, collectibles, dolls, Quilting, Quilts and tagged antique, armand marseille, arranbee, china, christmas, collectibles, doll, limoges, quilting, Quilts, roses, tea cups, tea pot on October 21, 2014 by S.J. Paquette. Setting for a special day. September and October have been two months of clearing and finishing projects that were needing that attention. 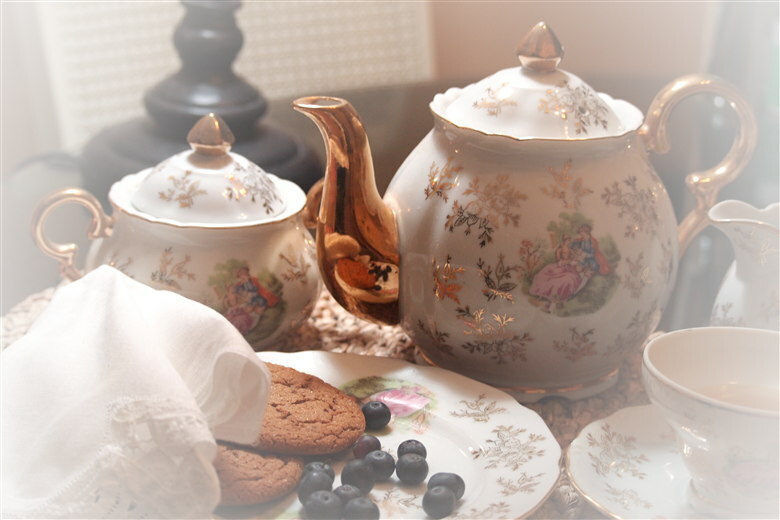 This lovely Early American Pattern Limoges tea set was a precious tea set that has been in my china cabinet for many years, about 20 to be exact. I decided it needed a new momma to enjoy it. It is available on my etsy site to purchase along with other delightful items. I hope you will take a moment and check us out. it is in excellent condition. The china is translucent which is the sign of lovely quality. Anyone for Tea today? The next project I needed to finish were my dolls that were packed away ever so carefully in special tissue but now needed sorting and some wonderful new clothing. A bit of this and that. 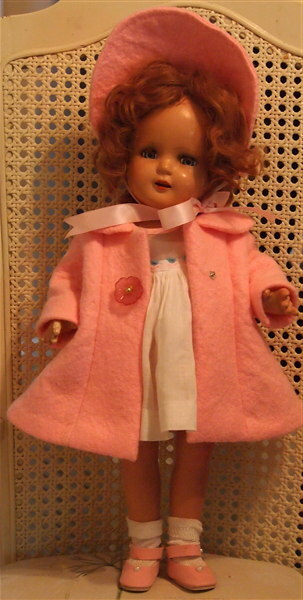 Nancy an Arranbee 15″ doll in her new pink wool coat and hat was a joy to dress up. Her antique dress o me to need a special coat and hat. If you want to be her new momma she is also available on my etsy site. Also Annabelle with her darling hat and jumper is a special love and endearing project. 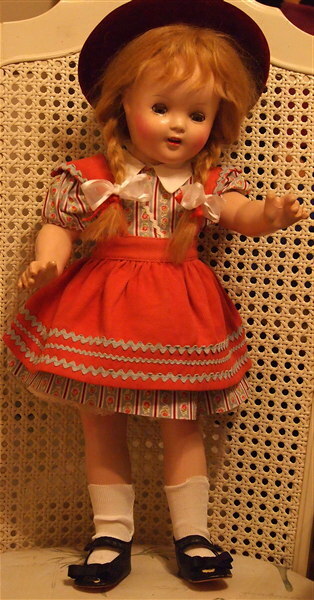 She is 19″ tall and also an Arranbee doll. 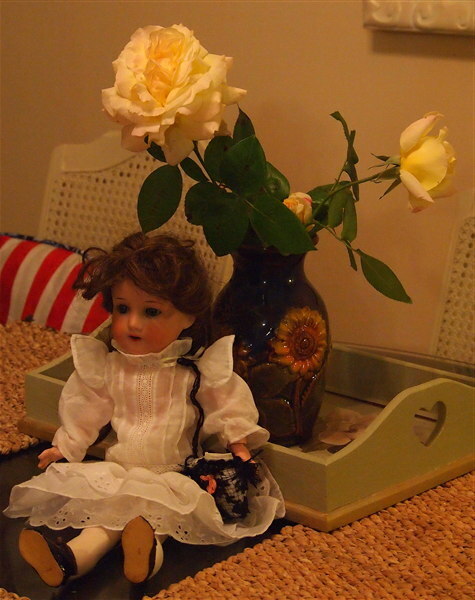 Still a special love is Isabelle that is a Armand Marseille doll that to me is very dear and also looking for a very special new momma. All this has made for a very busy two months but, oh so much fun. I don’t think I ever got over loving beautiful dolls. I hope you enjoy looking at these babies and my labor of pure joy. This entry was posted in antique, Arranbee, bisque, china dishes, collectibles, dolls and tagged canning, china, collectibles, limoges, marmalade, tea pot, tea set on October 21, 2014 by S.J. Paquette.